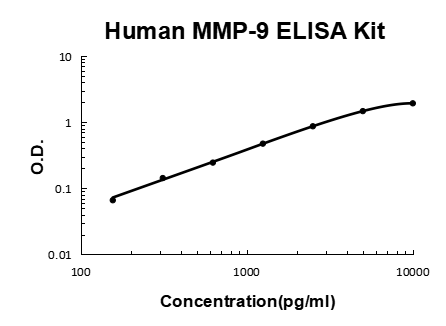 Sandwich High Sensitivity ELISA kit for Quantitative Detection of Human MMP-9. 96wells/kit, with removable strips. May play an essential role in local proteolysis of the extracellular matrix and in leukocyte migration. Could play a role in bone osteoclastic resorption. Cleaves KiSS1 at a Gly-|-Leu bond. Cleaves type IV and type V collagen into large C-terminal three quarter fragments and shorter N-terminal one quarter fragments. Degrades fibronectin but not laminin or Pz-peptide. . The 92-kD type IV collagenase is also known as 92-kD gelatinase, type V collagenase, gelatinase B, or matrix metalloproteinase-9(MMP9). The 72- and 92-kDa type IV collagenases are members of a group of secreted zinc metalloproteases. The matrix metalloproteinases(MMPs) are able to degrade the extracellular matrix and allow angiogenesis and tumor invasion. Gelatinase B, a matrix metalloproteinase that has proteolytic activity against connective tissue proteins, has been suggested to be important in the connective tissue remodeling processes associated with atherogenesis and plaque rupture. MMP-9 is predominantly expressed in neutrophils, macrophages, and mast cells, rather than in oncogene-positive neoplastic cells. The polymorphism of MMP-9 acts as a genetic factor for the development of smoking-induced pulmonary emphysema. The standard product used in this kit is recombinant human MMP-9 with the molecular mass of 95KDa. The detected MMP-9 includes zymogen and active enzyme. Sun Y, Yang D, Xi L, Chen Y, Fu L, Sun K, Yin J, Li X, Liu S, Qin Y, Liu M, Hou Y. Cell Death Dis. 2018 Jan 26;9(2):122. doi: 10.1038/s41419-017-0133-1. Primed atypical ductal hyperplasia-associated fibroblasts promote cell growth and polarity changes of transformed epithelium-like breast cancer MCF-7 cells via miR-200b/c-IKKβ signaling. Lin H, Qu Y, Geng Z, Li C, Wu H, Dong N, Liu Z, Li W. Plos One. 2014 Jan 31;9(1):E87368. Doi: 10.1371/Journal.Pone.0087368. Ecollection 2014. Air Exposure Induced Characteristics Of Dry Eye In Conjunctival Tissue Culture. Chen Sz, Yao Hq, Zhu Sz, Li Qy, Guo Gh, Yu J. Oncol Lett. 2015 Feb;9(2):915-919. Epub 2014 Dec 4. Expression Levels Of Matrix Metalloproteinase-9 In Human Gastric Carcinoma. Tan Sy, Wang Jy, Shen L, Luo Hs, Shen Zx. World J Gastroenterol. 2007 Apr 14;13(14):2108-12. Relationship Between Preoperative Staging By Endoscopic Ultrasonography And Mmp-9 Expression In Gastric Carcinoma. Tang Xp, Tang Gd, Fang Cy, Liang Zh, Zhang Ly. World J Gastroenterol. 2013 Mar 14;19(10):1582-92. Doi: 10.3748/Wjg.V19.I10.1582. Effects Of Ginsenoside Rh2 On Growth And Migration Of Pancreatic Cancer Cells. Mazani M, Fard As, Baghi An, Nemati A, Mogadam Ra. J Pak Med Assoc. 2014 Jul;64(7):785-90. Effect Of Pomegranate Juice Supplementation On Matrix Metalloproteinases 2 And 9 Following Exhaustive Exercise In Young Healthy Males. Liu Q,, Zou R, Zhou R, Gong C, Wang Z, Cai T, Tan C, Fang J. J Cell Biochem. 2015 Jul;116(7):1213-21. Doi: 10.1002/Jcb.25073. Mir-155 Regulates Glioma Cells Invasion And Chemosensitivity By P38 Isforms In Vitro. A: Yes, Boster’s EK0465 is able to detect both the secreted and active form of MMP9. A: The normal value of MMP-9 in human serum is about 173~698 ng/ml, that in human plasma is about 13.9~104 ng/ml.